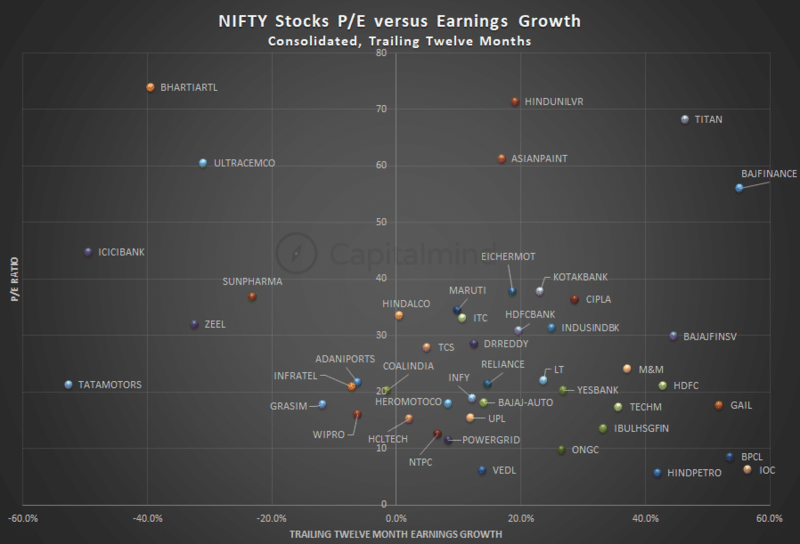 There’s problem in the P/E of the Nifty. 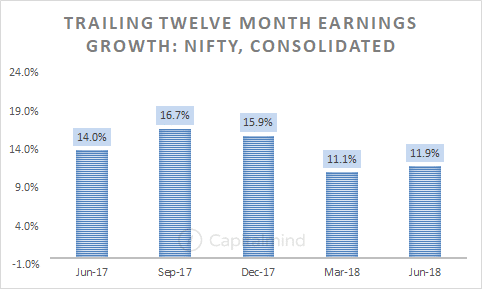 It’s calculated based on the standalone earnings of the Nifty companies. This isn’t always fair – because many of these companies have become huge conglomerates with subsidiaries worldwide. So we should consider consolidated results instead. The data that NSE gives us is the standalone numbers. The consolidated market cap of the Nifty companies is around 84 lakh crores. That means the consolidated P/E of the Nifty is about 23. This isn’t as high as what’s seen in the Nifty P/E history (which shows a number of 28 or so) but in relative terms, measured on a consolidated basis, it’s still around the highest it has ever been. Meanwhile, how much have consolidated earnings grown? As we can see, earnings growth was more visible in the previous year. Which is strange, because the previous year saw two quarters of rough returns due to demonetization. And then a quarter (June 2017) of having the GST ahead of you. And still, one year later, when that should have been a lower base, the earnings growth is 4 percentage points lower! Still, you have to note that we continue to pay the index a 23 P/E, when earnings growth has been declining, on a consolidated basis. In fact taking only this quarter (June 2018) and looking at the 3 month results compared to June 2017 quarter, growth is just 3.6% on profits! The standard argument is oh wait SBI had a big loss, let’s take it out. Or that come on you don’t expect Axis bank to report loss every quarter. But the point of “aggregates” is that in any situation some stock, or the other, will have extraordinary losses. If there is some extraordinary thing every quarter, it is known in the real world as: ordinary. 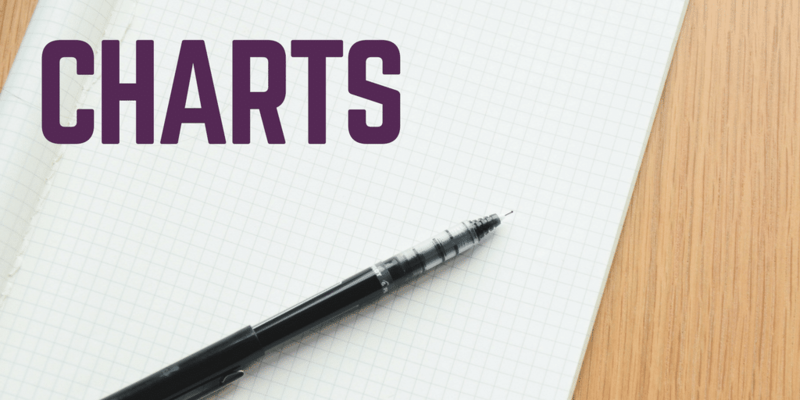 So, we have used trailing twelve months (to smooth out some silly things that might have happened only this quarter) and we add up all the profits, including any losses. This gives us a fair picture on whether earnings are growing or slowing. Lupin: Profits fell over 90% and so P/E is off the chart at 300+. SBI: With TTM loss of over 4,500 cr. there is no P/E because of lack of “E”. Axis Bank: Again, losses make the P/E negative. First, that the OMCs are low P/E and high earnings. They make a lot of money, these guys. HPCL, BPCL and IOC together make for more than 10% of the profits of the Nifty. Add RELIANCE, and that’s 20% right there. But the OMCs are growing profits tremendously and are valued at sub-15 P/Es. GAIL too has some really good earnings growth. What you really want is stuff to the bottom (low P/E) and to the right (high earnings growth). In fact you’d be good to look at anything with earnings growth. If Bajaj Finance kept up earnings growth for a year, then even at current prices the p/e would fall to a more affordable 36. Titan too is doing incredibly well on earnings, even with the high P/E. There are pockets of interest: some private sector banks – high P/E and high growth. Housing finance companies – lower P/E and high growth. If we took an average of all the stocks, the average P/E is 27. That’s still a little high, you would think, of an index that mostly has earnings growth coming from the lower P/E oil and gas players. Still, context is everything and P/E is just one aspect of valuation, so we hope this adds colour to your view of the index.